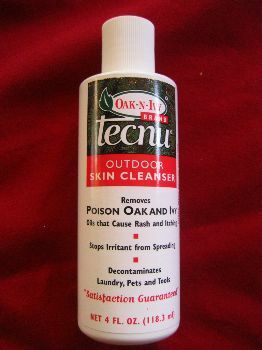 Tecnu Poison Poison Ivy/Oak/Sumac Skin Cleanser, 4 oz. Removes the oil, urushiol (oo-roo-she-all), from poison ivy, oak, and sumac that causes rash and itching. Apply to dry skin for two minutes and rinse with cool water or wipe off with a cloth. When used within 2-8 hours after exposure to the plants, Tecnu can remove urushiol oil before rash begins. Once the rash has started, washing with Tecnu helps remove any free oil on skin allowing the natural healing process to begin without possible recontamination. Use Tecnu to remove oil from contaminated clothing, shoes, gloves, tools, and pets. Ingredients: deodorized mineral spirits, water, propylene glycol, octylphenoxy-polyethoxyethanol, mixed fatty acid soap, fragrance.